Maybe it’s because I’m getting older and more inclined to speak my mind. Maybe it’s because I’m so passionate about being vegan. Maybe it’s something I haven’t even thought of yet. Whatever it is, I’ve become one of those people. A letter-to-the-editor-writer. I’ve been ranting on Technorati for a while now and then there was my recent response to The Plain Dealer article about veganism and earlier this month, I fired off a letter to the editor of Cooking Light magazine. That letter had been simmering inside me for quite some time and when I got a notice that I was about to receive my last issue, the spark was lit. They needed to know (well, I thought they needed to know) why I wasn’t renewing my subscription, even though I’d been a loyal subscriber for many years. And since my letter has very little chance of seeing the (cooking) light of day otherwise – no doubt an efficient administrative assistant has filed my letter under Crazy Vegan – I decided to “publish” it here on my blog. What about you? Have the urge to let someone know how you feel about veganism? I have been a mostly-on, sometime-off again subscriber to Cooking Light for over 20 years. One shelf of my cookbook bookcase is devoted to Cooking Light Annual Recipe books, all of them filled with sticky notes and my terrible penmanship. One way or another, Cooking Light has been a trusted kitchen companion for a long time. However, I am once again letting my subscription lapse – permanently this time. Cooking Light’s culinary path and mine have finally diverged too far. You see, a little over a year ago, after many years as a vegetarian, I adopted a plant-based diet; one that also excludes refined sugars and added oils (even the so-called “good” ones like olive oil). This was an ethical choice, but primarily one made for health, based on the powerful evidence presented in T. Colin Campbell’s The China Study and Dr. Caldwell Esselstyn’s amazing book, Preventing and Reversing Heart Disease. The recent Harvard School of Public Health study further confirms their findings: that consuming meat is associated with increased risks of death by cardiovascular disease and cancer. As the evidence of the benefits of adopting a plant-based diet and foregoing meat and dairy mounts, Cooking Light’s recipes become less and less relevant to my lifestyle and the way that I wish to care for my body. It is not enough anymore to eat light. I am very surprised that Cooking Light has apparently chosen to ignore both Campbell’s and Esselstyn’s findings. It would be wonderful to see the magazine blaze a trail – to encourage its readers to eat not only lightly, but thoughtfully, ethically and healthfully by preparing and consuming meals that are animal-free. Cooking Light could help shatter the myths that a vegan diet is boring, difficult to follow, time-consuming to prepare, and that getting the necessary vitamins, minerals and protein is next to impossible. At 45, I am in the best shape of my life. I run, practice yoga, lift weights, garden, keep up with a puppy, write a vegan recipe blog, prepare three meals a day, bake all of our own bread and run a small greeting card business from my home. I have the energy of an eighteen year old (as long as that 18 year old isn’t eating the typical “Western” diet, that is!). I am not suggesting that Cooking Light become a vegan recipe magazine. That would be unrealistic considering the strong pull our society seems to have to consume meat and dairy. A change that big takes time. However, it would be a benefit to subscribers to at the minimum include plant-based recipes in each issue – not coated in cheese or based on eggs as the recipes in The Enlightened Cook/Everyday Vegetarian section are now. True enlightenment would be to include dairy-free, plant-based recipes! By the way, it is a shame that Mark Bittman’s column very often includes meat; he has wonderful vegan recipes that I’m sure would satisfy cooks and eaters of all stripes. Thank you for many years of cooking enjoyment and learning. 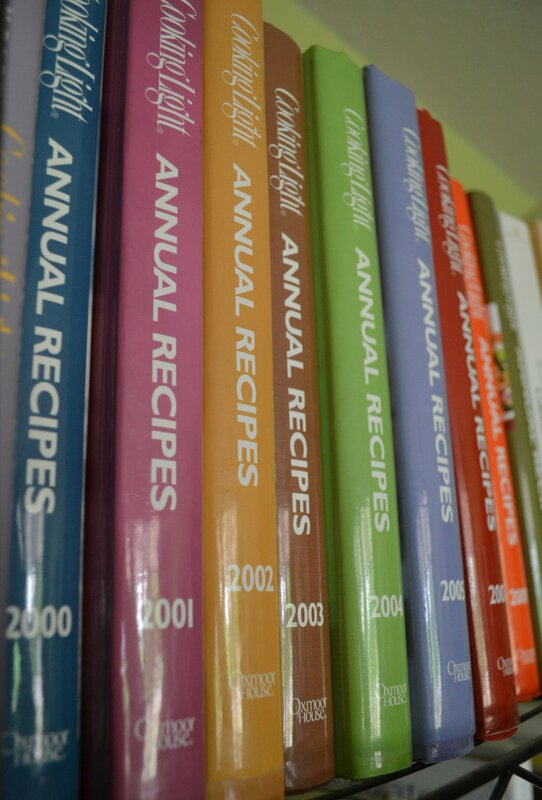 My Annual books will remain on my shelves – it is a challenge for me to veganize these recipes and some have become beloved staples. When Cooking Light decides to include creative, delicious and healthy plant-based recipes within its pages, let me know. I will happily become a subscriber once again. P.S. For dinner this evening, I prepared a recipe from my final issue (April 2012). It’s the Eggplant Involtini recipe from Everyday Vegetarian. I made an easy tofu ricotta – it’s so creamy and flavorful it blows the “real” stuff away – and topped the eggplant rolls with cashew cream instead of Parmesan. Here here! I am in complete agreement. I let mine lapse years ago because of the egg and cheese vegetable coatings. I agree that there is much to be learned from it and my family enjoys a much broader set of flavor profiles because of the mag. “Enlightened” vegetarian just wasn’t cutting it. Thank you! Yeah, I just got tired of modifying everything and reading how things that I believe are BAD for my body are okay. Thanks, Lynette…I would really be curious to know how it was received. Would you believe 5 of my friends have gone plant based as a result of sharing my knowledge with them. One of them brought ME a beautiful vegan meal yesterday. I was so proud I wanted to cry. I have had a beef (pun intended) with my runner’s world magazine for publishing lots of recent nutrition articles about fueling with protein. There were lots of photos of steak and eggs and chicken in a that particular copy, and lots of text as to why they are the best sources of protein. it was literally making me sick. I was considering cancelling my subscription because even though I love the motivation and amazing stories they publish, I can’t help being of the mindset that they are perpetuating LIES. I even thought about a letter to the editor, but then lost momentum. Then to my surprise, I got my new runner’s world in the mail yesterday – It has an article on Scott Jurek, the vegan ultrarunner, the article talked extensively about his diet. I wanted to stand up and cheer. I understand that because of their readership they probably need to cover both sides of nutrition to maintain their subscriptions. It was a proud moment for me though reading that article. That is SO wonderful that you’ve turned people onto a plant-based way of eating! That is a major accomplishment. It can be a very sensitive and delicate subject…And I agree with you on Runner’s World! I get it, too, and the food section makes me absolutely crazy!! I was psyched to see the article on Scott Jurek and can’t wait to read it! Somer, thanks for your thoughtful comment!! I too was a faithful Cooking Light subscriber / reader for years. Oh the stackes of back issues I had! I cancelled my subscription several years ago – I paid a premium being in Canada and it just wasn’t worth it anymore. Last month – I purchased my first Cooking Light mag in a long time. I was so dissappointed, dissappointed by the waterdowned healthly eating advice and the lack of recipes I could just make without major overhauls. And I don’t call myself vegan…. yet. Okay, so I’m not so alone in my view of CL! Interesting! They did change the look of their magazine a while back and I guess have altered the contents and mission as well…We really need a GOOD vegetarian/vegan publication! It is important to get your word out there. I live right outside of Boulder Colorado and have been catering and serving food to the Boulder community for 10 years. I have seen a dramatic drop in vegetarian and vegan requests. I am not vegetarian or vegan but have cooked for both and offered many selections on my menus to Boulder clients. The big request lately is for Gluten free or paleo which are not vegetarian. Perhaps this is a nation wide trend and why CL is not featuring as much vegan, vegetarian recipes as they have in the past. I do believe that cooking light magazine is just “light” now without any substantial healthy cooking advice. I haven’t purchased the magazine in at least 5 years. Connie, I find your observations really interesting! I’m surprised that even in Boulder you are finding a move away from veg/veganism. (BTW, I lived in Boulder for 5 years). Well done. While they likely won’t publish it – as you’ve noted – maybe it will cause them to think. I hope that he reads every last word of this! Good for you, your passion is evident and inspiring! WOO-HOO! You GO Ann! This post has me beaming from the depths of my little vegan heart! I feel this way ALL OF THE TIME and I often am left feeling even more isolated when I see magazines etc. that are so animal product based. It really makes me fear for our future as a species! I completely get the need to just VENT about everything, but I also understand your reservations and concerns about just being stuffed into the “crazy vegan” category. This is something that I too struggle with when I aim to take political action against larger systems that ultimately oppress other beings. I am so incredibly PROUD to have been reading your blog at this moment! Keep it going, fellow vegan!!!! Awww, wow, Rachel! Thank you so much! I respect and admire you so much – partly because you do speak your mind and don’t keep quiet about what is wrong. Hugs! If Mr Mowbray has any sense he’ll invite you to write a column in his magazine. Excellent letter! From your keyboard to his ears ;-)! Thank you! I write that same letter in my head every time I read Cooking Light, lol. I have been a subscriber for years and years too, and this is the first year I have not subscribed in a very long time. Every issue I would flip through to the “vegetarian” section with anticipation, only to see every recipe having eggs or dairy. Of course, I can modify just about any recipe at this point, but still…it would have been nice to have an actual vegan recipe a little more often! Hi Courtney! Yeah, I mean it really got to be kind of a joke! It was as if the CL chefs weren’t creative enough (or were too lazy) to think of anything vegetarian without being overloaded with dairy! Thanks so much for visiting and commenting! What a beautifully spoken letter! I totally feel you and since becoming vegan, I have become a letter-writer as well. I have only had positve results. Just as your end-of-subscription note was the spark that motivated the letter, perhaps your letter will be the spark CL needs to move towards change. I used to have a subscription, but I let it lapse (and Eating Well) for the same reasons as above, but also because I found their recipes to be mostly uninventive recreations of the Midwestern “Meat starch and veg” meals I grew up with. AND, most importantly, I’d read the recipe and think–this is going to be tasteless! Although I’m an on-again-off-again vegan (trying to find a way to cook for me as vegan and The Husband as not), I don’t agree with the meat-focused view that the U.S. seems to have, and the lack of awareness that it’s not just killing ourselves, but our planet. too. Good for you, Ann, for telling them how you feel! It’s the only way they will improve. And, P.S., after being the editor of Victorian Homes mag for a while, your letter was very nice and polite. You should have seen some of the nasty letters I received! Ahhh, yes! You never do! Thanks, Shira! How did you know they filed it under “Crazy Vegan”? This letter is most eloquent and thoughtful just to be dismissed with such label. But then again, from the sound of it, seems like they just mislabel things anyway as they should have been appropriately called “Cooking Heavy”. Not sure if it could have said any better!! Bravo to you!! kudos! Apathy will be the death of us. I wrote a similar letter to Chatelaine (a Canadian magazine) a while back. I let my subscription run out a few years ago, and haven’t looked back. Like you said, it just becomes a bit ridiculous to have to veganize all of their recipes, and know that if I can do it, surely their chefs can too! I love that: apathy will be the death of us. So true! Very well said! I wanted to write a letter to the editor of The Sacramento Bee the other day when they wrote a very vegan-bashing article about how hard it is to make the transition to veganism and how no one will support you and you are denying your tastebuds pleasure and blah blah blah…I read it and tried not to let it get to me too much. In the end I just laughed at the article for it’s attempt to shine a harsh light on the amazing and positive life changing effects that veganism has… BUT now after reading your awesome letter to Cooking Light I sort of wish I HAD written them! Seems as if these kinds of articles are “going around.” I replied to one that sounds very similar that was published in my hometown newspaper. It just irritated the heck out of me and was so full of bad info! One could spend their whole day fighting, but in the end, we just have to pick our battles. Thanks for your comment! thanks for putting a ridiculously huge grin in my face tonight! I have an expansive collection of cookbooks both vegetarian and not but I agree I am finding that they all increasingly revolve around dairy and eggs. I do eat eggs but I can’t eat much dairy (and also the more I am learning the more I am not wanting to eat dairy) and so I am constantly scribbling new versions of the recipes down! Although I actually think this has helped me grow as a cook it is not helping other people understand a better way of being vegetarian! I completely agree with you. Going vegan has really expanded my food horizons and “forced” me to be more creative. Definitely a good thing!